Line a shallow baking pan with parchment per and spread the sesame seeds on it and bake for about 5 minutes to toast lightly. Pour the honey plus 4 tbsp of water in a small sauce pan and slowly bring to boil. Add the lemon juice and the toasted sesame seeds and boil gently until the mixture reaches the soft ball stage. 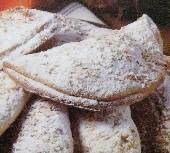 Line a small shallow baking pan with parchment paper and brush lightly with the melted butter. 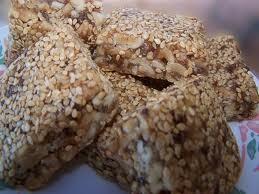 Pour the sesame-honey mixture and spread out evenly to the desired thickness. Before it cools down completely, with a sharp knife, cut at any size or shape you want. Once the Pastelli is completely cold, Turn it over and remove the parchment paper. Store in airtight containers for up to a month between layers of wax or parchment paper. 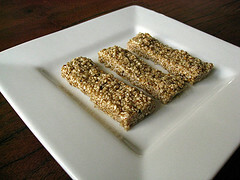 Pastelli (Honey-Sesame Snacks) is the perfect snack for the whole family in between meals.